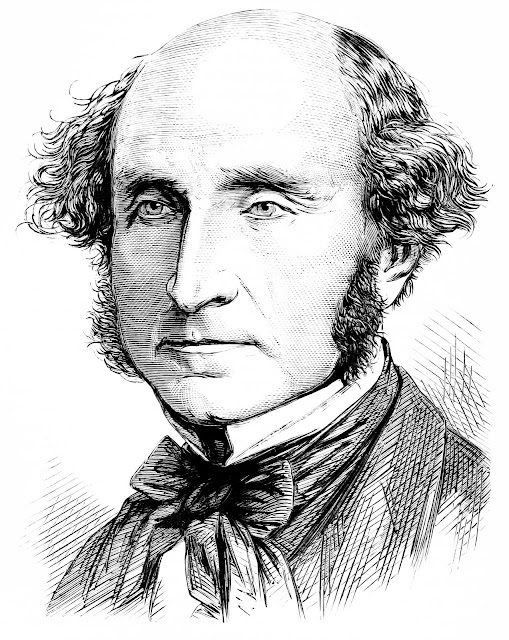 The most famous defence of free speech in the Western philosophical canon is, undoubtedly, the argument from Chapter 2 of John Stuart Mill’s essay On Liberty. In recent debates about freedom of expression on college campuses, it is amazing how frequently the opponents of campus speech codes, trigger warnings, no-platforming, de-platforming and other speech regulations reach for Mill’s essay. One of the most prominent recent examples of this is the publication of a lavish illustrated edition of Chapter 2 of On Liberty by the Heterodox Academy, an organisation dedicated to ensuring ‘viewpoint diversity’ on college campuses. So enamoured are they by Mill’s argument that they think it is important to make it accessible and attractive to a new generation. What is it about Mill’s argument that appeals more than 150 years after it was first published? Well, Mill was undoubtedly a great writer, particularly in his more polemical essays (I could take or leave the Principles of Political Economy to be honest). On Liberty crackles with passion and verve. You can’t help but get swept up in Mill’s enthusiasm for liberty, and impatience with censors and oppressors, when you read it. What’s more, many of the issues and arguments raised still feel relevant today. For better or worse, modern liberal democracies live in the shadow of Mill’s reasoning. We still regularly debate issues around censorship, regulatory interference and the 'Nanny' state in terms that he first set down. ..the peculiar evil of silencing the expression of an opinion is that it is robbing the human race; posterity as well as the existing generation; those who dissent from the opinion, still more than those who hold it. If the opinion is right, they are deprived of the opportunity of exchanging error for truth; if wrong, they lose, what is almost as great a benefit, the clearer perception and livelier impression of truth produced by its collision with error. (1) The truth (and a clear and lively impression thereof) is valuable; we ought to allow/enable people to arrive at true beliefs about the world. (2) Freedom of speech enables/allows people to arrive at a clear and lively understanding of truths about the world (or, what is the same thing, the silencing or censorship of expression prevents people from arriving at a clear and lively understanding of true beliefs about the world). (3) Therefore, we ought to promote freedom of speech (and prevent the silencing or censorship of expression). Most of Mill’s time and energy is dedicated to the defence of the second premise of this argument. On a surface reading, he seems to think that guaranteeing freedom of expression is a truth-and-understanding generating mechanism. Or, to adopt the modern idiom, he seems to think that if we allow the ‘marketplace of ideas’ to unfold without interference, the truth will out. Of course, it’s a little difficult for those of us standing here today — in the post-truth, post-Trump era — to get fully onboard with this. This might be one reason why modern commentators are quick to reject Mill’s argument but I think they are wrong to do so on this surface reading. It involves a partial distortion of Mill’s view. Mill is not a rosy-eyed optimist about the marketplace of ideas. His argument for free speech has something in common with the Churchillian defence of democracy: it’s the worst system for ensuring truth and understanding, bar all the others. 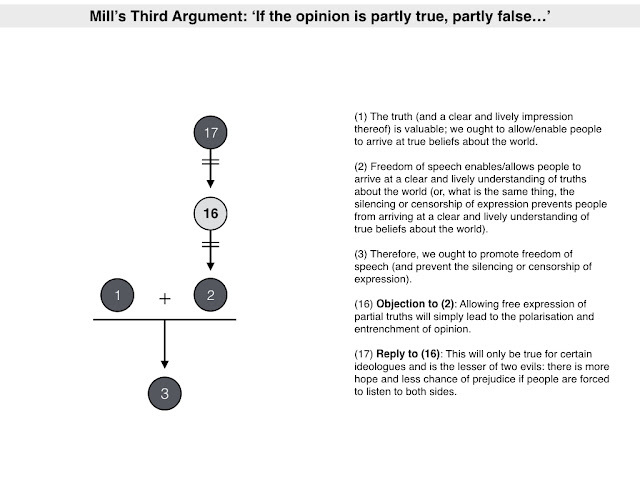 Let’s see how this works by going through the sub-arguments that Mill provides in support of premise (2) of the main argument. These arguments are essentially summarised in the quoted passage above, and depending on who you ask, there are either two or three of them. I think there are really two important sub-arguments, with a third one that is kind of a mish-mash of the first two. I’ll go through each in turn and then come back to consider some general problems with Mill’s reasoning. (4) If we censor an expression, and if that expression is true, then people are denied the opportunity to exchange truth for error. This directly supports premise (2) of the main argument. It is so straightforward that surely no one could object? But, of course, they do. The defender of censorship can respond to this point and argue that we can trust censors to filter out the true expressions from the false ones. That way we can have censorship, without denying people access to the truth. Mill scoffs at this because it presumes that the censor is infallible. He says we have ample evidence (and common sense) to suggest that people are not infallible and capable of weeding out the truth from the falsehood. There is no perfect censor. History teaches us this lesson. In past ages, opinions and ideas were suppressed that we now know to be true (or, at least, accept as true). As Mill puts it ‘ages are no more infallible than individuals’. The beliefs which we have most warrant for, have no safeguard to rest on, but a standing invitation to the whole world to prove them unfounded… This is the amount of certainty attainable by a fallible being, and this is the sole way of attaining it. Men are not more zealous for truth than they often are for error, and a sufficient application of legal or even social penalties will generally succeed in stopping the propagation of either. I think this quote, in particular, highlights the point I made earlier: that Mill is not naive about the prospects of truth winning out in the marketplace of ideas. He recognises the fact that people are fallible and sometimes biased against the truth. He just thinks that adopting a censorious approach is worse than allowing for the free exchange of ideas. (5) Objection to (4): Censorship does not necessarily undermine the pursuit of truth: we could trust the censor to filter out the untrue opinions and allow the true ones to get through. (6) Reply to (5): This assumes an infallible censor: we have ample evidence from our own experiences and from history to suggest that censors are not, and cannot be trusted to be, infallible. (7) Reply to (5): The only check against infallibility (and the only reason to feel confident in our grasp of the truth) is the testing of our opinions in the fire of free expression. (8) Objection to (4): Even if we did censor the truth, the truth will eventually win out over the censorship. (9) Reply to (9): There is no guarantee of this. We are not more zealous for the truth than for error and if the social penalty is sufficiently high the truth will be blocked. (10) If we censor expressions that are false, then our beliefs will be ‘held as a dead dogma[s], not living truth[s]', i.e. we will not have a clear and lively understanding of the truth. Again, this reason is supposed to support premise (2) of the main argument. For what it is worth, I find this to be a credible claim. There are certain things I believe to be true (e.g. the theory of evolution, the non-existence of God as traditionally conceived, and the moral permissibility of homosexuality) that I really only first appreciated by systematically engaging with contrary points of view. You might, however, disagree. You might argue that we can get a perfectly good grasp of the truth by just looking at the arguments in favour of the truth. Take for example, the truth of the Pythagorean theorem. Surely we can understanding this truth just by considering its proof? We don’t need to entertain the opinions of radical anti-Pythagoreans. There is no fear of dead dogmas here. The proof itself is all we need. So essential is this discipline to a real understanding of moral and human subjects, that if opponents of all important truths do not exist, it is indispensable to imagine them, and supply them with the strongest arguments which the most skilful devil’s advocate can conjure up. You might object that this still doesn’t make the case for free expression. Maybe only some people need to have access to contrary opinions (e.g. professors, politicians and other elites). They can test ideas out, get a full and lively impression of the truth, and then they can tell the rest of us about it. Call these people the ‘epistemic elite’. In some of his writings Mill was sympathetic to the idea of an epistemic elite, once going so far as to suggest that the votes of the educated be given extra weight in elections. For all his radicalism he was a man of his times, and, as we saw above, he was sceptical about the cognitive powers of the great mass of humanity. But he wasn’t a fan of limiting freedom of expression (and note there would still need to be some freedom of expression) to an epistemic elite. Who can compute what the world loses in the multitude of promising intellects combined with timid characters, who dare not follow out any bold, vigorous, independent train of thought, lest it should land them in something which would admit of being considered irreligious or immoral?… Not that it is solely, or chiefly, to form great thinkers, that freedom of thinking is required. On the contrary, it is as much and even more indispensable, to enable average human beings to attain the mental stature which they are capable of. 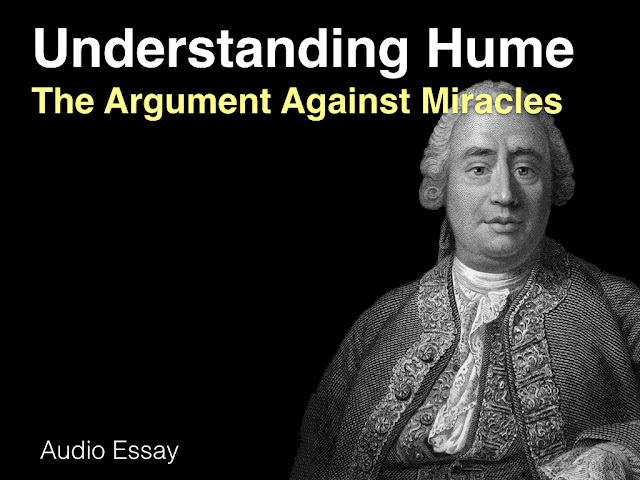 Finally, even if you accept this you might worry that Mill’s argument demands too much. He seems to be saying that we must constantly and continually renew our conception of the truth through engagement with gadflies and contrarians. Surely that would be exhausting? Yes, but this is what the vigorous pursuit of the truth requires. (12) Reply to (11): This is only possible in a narrow range of cases; in the great majority of cases understanding is only possible by considering and engaging with the contrary point of view. (13) Objection to (10): Even if we need to engage falsehoods to grasp the truth, this does not support free expression: an epistemic elite could be given the task of engaging the falsehoods on our behalf. (14) Reply to (13): There would still need to be some freedom of expression for this elite. (15) Reply to (13): We should not limit freedom of expression to an epistemic elite: everyone should be allowed to achieve the mental stature they are capable of; and we may be depriving the world of something by not encouraging promising intellects to vigorously pursue the truth. 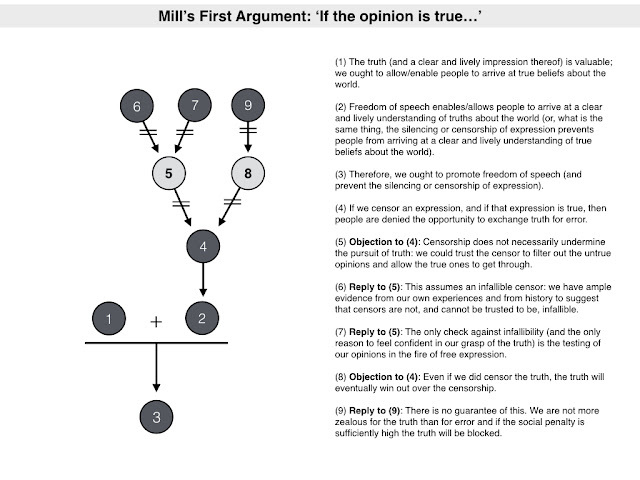 The two preceding arguments constitute the backbone of Mill’s defence of free speech. 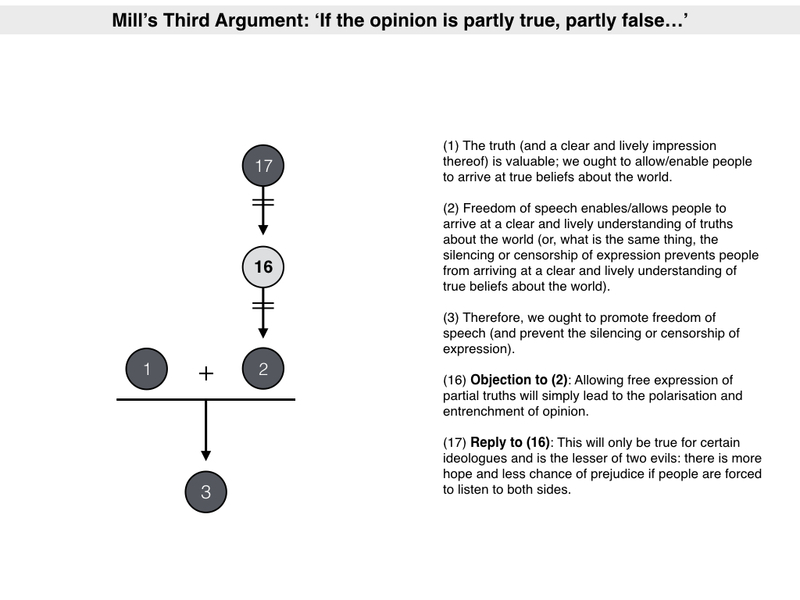 However, Mill himself divides his argument into three parts. This is because the two preceding arguments presume the extreme — cases in which we are trying to suppress/censor an opinion that is wholly true or wholly false — and the reality is likely to be more nuanced. We are more likely to encounter opinions that are partly true and partly false. What should we do with them? Well, obviously we should allow for their free expression. The reason for doing so is a mish-mash of the two previous arguments: to do otherwise would deprive us of the partial truth and engaging with the partial lie will help with understanding. I don’t think there is a distinctive argument here. I acknowledge that the tendency of all opinions to become sectarian is not cured by the freest expression but is often heightened and exacerbated thereby; the truth which ought to have been, but was not, seen, being rejected all the more violently because proclaimed by persons regarded as opponents. … it is not on the impassioned partisan, it is on the calmer and more disinterested bystander, that this collision of opinions works its salutary effect. Not the violent conflict between parts of the truth, but the quiet suppression of half of it, is the formidable evil. There is always hope when people are forced to listen to both sides; it is when they attend to only to one that errors harden into prejudices. In other words, freedom of speech is the lesser of two evils. (16) Objection to (2): Allowing free expression of partial truths will simply lead to the polarisation and entrenchment of opinion. (17) Reply to (16): This will only be true for certain ideologues and is the lesser of two evils: there is more hope and less chance of prejudice if people are forced to listen to both sides. So that’s Mill’s argument. As you can see, it is a reasonably nuanced defence of the ideal of free speech. To reiterate what I have said already, I don’t see Mill as a rosy-eyed optimist. He doesn’t see free speech as a panacea for truth. He sees it as the least worst option. But even with that more nuanced understanding in place, there are many concerns one can have about the argument. I can’t list all of them, but here are a few of the more prominent criticisms. First, one could question the value of truth. While I think most people would agree that truth has some value, I doubt they think it is the only thing of value. Individual welfare and well-being are also valuable, as is respect for people from diverse backgrounds. We may worry that prioritising the value of truth undermines these other values, on at least some occasions. Indeed, this perceived tension is, arguably, at the root of many contemporary debates about free speech. There is a fear that allowing any and every opinion to be expressed (even if true or partly true) has a negative impact on individual well-being and inclusiveness. Ironically, Mill himself grappled with this tension. He was a utilitarian and so did worry about whether truth was compatible with the principle of utility. He thought it was, but he may have been too quick to believe this. Second, one could be generally sceptical about the existence of truth, at least in all domains of inquiry. Maybe there is no such thing as the truth in moral and political debates? Maybe there is only the endless back and forth of partisan opinion and what matters is how it makes you feel not whether it is true? If you believe this, you might be more open to censorship and Mill’s argument might hold no sway. I, myself, would reject this extreme form of scepticism. I’m more with Mill. I think there are some truths in moral and political life and that the only check we have against our own fallibility and prejudice is to engage with conflicting opinion. Third, one could be concerned about the practical impossibility of Mill’s ideal. Some people interpret the ideal of free speech to entail ‘viewpoint neutrality’ when it comes to the regulation of speech, i.e. all views are to be treated equally and equally worthy of debate and consideration. But it’s not possible to be completely viewpoint neutral. As a society we are always, implicitly or explicitly, censoring some views. We decide that certain ideas and certain people are worth engaging with and others are not. The decision to invite one person to speak at an event is the decision to exclude another. The decision to include some topics on a course curriculum is the decision not to include others. And so on. We cannot stop this indirect censorship from taking place. At best, following Mill, we can try to check ourselves against narrow-mindedness. 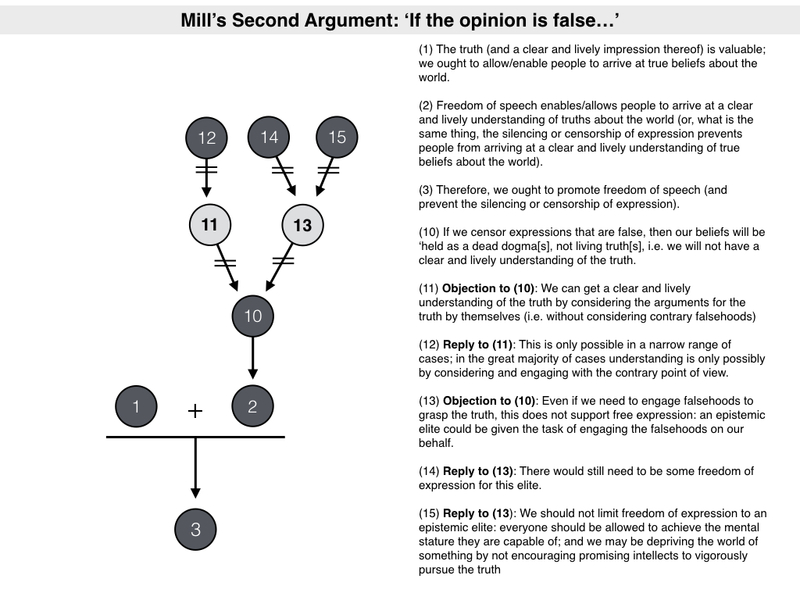 Fifth, and finally, it’s worth noting that Mill was not a ‘free speech absolutist’ and, indeed, that the notion of free speech absolutism does not make much sense. Mill thought that speech that directly incited violence to others should be prevented. And many other self-labelled ’absolutists’ accept similar restrictions. They argue that fraudulent speech or speech that amounts to common assault (i.e. causes fear of physical violence) should be subject to some legal restriction (as they have been for centuries). But once you allow for this you start to realise that the borders between permissible and impermissible forms of speech are highly contested. What counts as speech amounting to assault or fraud? What kinds of speech cause real harm? People have different opinions and different experiences. Perhaps that's the real argument for free speech: to allow people to air their different opinions about the value of free speech. Okay, so that’s it. That’s all I have to say about Mill’s argument for free speech. Hopefully this clarified things for some people.